Picture History of British Ocean Liners, 1900 to the Present by William H. Miller Jr.
We’d love your help. Let us know what’s wrong with this preview of Picture History of British Ocean Liners, 1900 to the Present by William H. Miller Jr.. 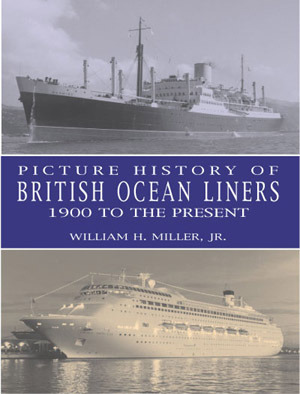 Preview — Picture History of British Ocean Liners, 1900 to the Present by William H. Miller Jr. This fascinating text-and-picture tribute documents both interiors and exteriors of majestic British ships such as the Viceroy of India, the Orion, Queen Mary, Queen Elizabeth, Windsor Castle, Pacific Princess, Royal Princess, Crown Princess, and Aurora. Over 200 rare black-and-white illustrations provide views of the ships at sea and in port. To ask other readers questions about Picture History of British Ocean Liners, 1900 to the Present, please sign up. About William H. Miller Jr.
William Henry Miller, Jr. (Bill Miller) (born May 3, 1948) is a maritime author and historian who has written numerous books dealing with the golden age of ocean liners. William H. Miller was born in Hoboken, New Jersey on May 3, 1948. In addition to his teaching career and writing over 80 books and many articles on the great liners, he was chairman of the World Ship Society's Port of New York Bran William Henry Miller, Jr. (Bill Miller) (born May 3, 1948) is a maritime author and historian who has written numerous books dealing with the golden age of ocean liners. Books by William H. Miller Jr.